In the case, where there are more than one cooling tower stacked side by side, then there might be a probability for the saturated exit air from one cooling tower of entering into other cooling tower and thus their placement and orientation with respect to each other play an important role. Mechartes with its vast experience, studies this phenomenon using Computational Fluid Dynamics (CFD). 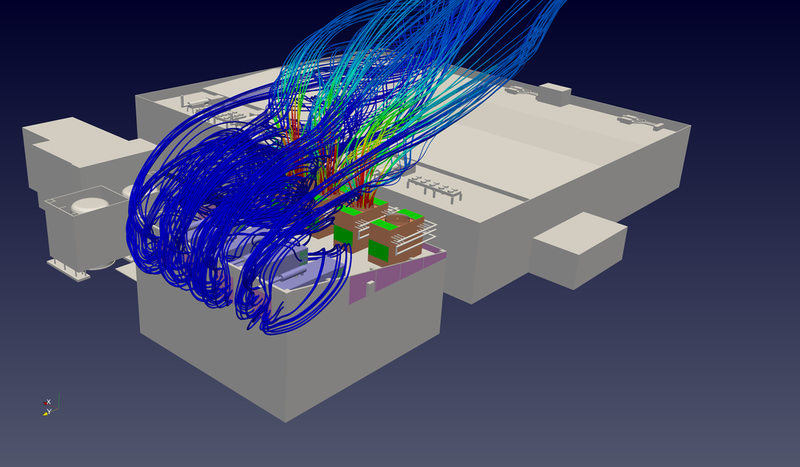 By using CFD simulations we can study the percentage of re-circulation and velocity profile within the yard before the installation of the unit. Mechartes have carried out CFD simulations during the design stage to study the percentage of circulation and provide solutions to proper placement of the units. Along with the effect on the performance, the effective dispersion of exhaust plumes from chillers and cooling towers into the atmosphere is crucial for health and safety of occupants, and in some cases. Prediction of recirculation percentage at each inlet of the units. Prediction of dry and wet bulb temperature. Optimization of placement of chillers/cooling towers.